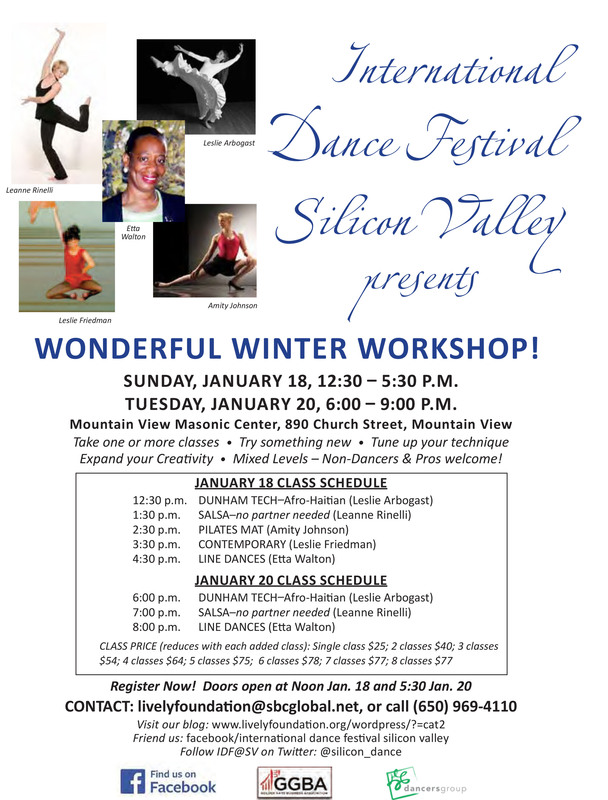 Wonderful Winter Workshop/TIME TO DANCE! Here’s the poster for WWW 1.0 It’s the first Wonderful Winter Workshop of IDF@SV. The International Dance Festival@Silicon Valley wants everyone –beginners & pros–to dance and have a wonderful time. Join us; it’s time to DANCE! How to register? Just send an email to livelyfoundation@sbcglobal.net Let us know which classes you want to take. Send a check to The Lively Foundation/550 Mountain View Avenue/Mountain View, CA 94041-1941. Prices are very reasonable, and the more classes you take the less they cost per class. Here’s the break down: $25 single class/$40 for 2/$54 for 3/$64 for 4/$75 for 5/$78 for 6/$77 for 7/AND $77 for ALL EIGHT! What you are looking at for example is paying $15 per class for 5 Master Classes with artist/teachers who are here to make you shine. OR Take all 8 classes and each class costs only $9.60. That is such a great deal! Email or call with ANY questions and then, come on and DANCE!!! This entry was posted in INTERNATIONAL DANCE FESTIVAL-SILICON VALLEY and tagged Amity Johnson, Contemporary Dance, Dance Master Classes, Dance workshops, Dunham Technique, Etta Walton, International Dance Festival-Silicon Valley, Leanne Rinelli, Leslie Arbogast, Leslie Friedman, Line Dancing, Mountain View CA, Mountain View Masonic Center, Pilates mat, salsa, Wonderful Winter Workshop on January 12, 2015 by Leslie.